Fully illustrated. Translated and edited from manuscripts in the British Museum by S. L. MacGregor Mathers. 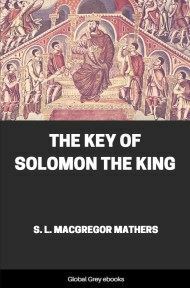 The Key of Solomon the King are believed to be the actual words and instructions of King Solomon himself. In these texts he instructs his followers on how to summon and master spiritual powers, including how to obtain answers to problems from the spirit world.